With relief came certain realism today after a dreadful performance against a Trinidad & Tobago side made up of Gillingham, Port Vale, Wrexham and Falkirk players. Whilst I am sure at home lager and national pride are prevailing over pure veracity, here 4,000 miles away it is hard to get even slightly moist at the thought of England's longevity in this competition. We are crawling into the next round at a snails pace with a broken metatarsal with dull as dishwater tactics, no shape, invention or firepower and very little, sorry I mean no excitement whatsoever. 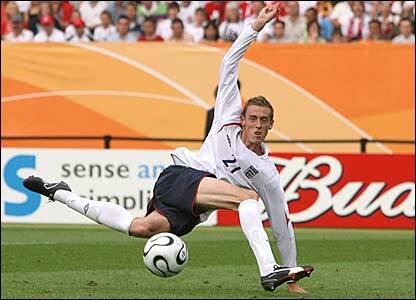 Beckham's delivery, goal aside, was terrible, Owen was awful, again and Crouch is frankly a joker. I wonder what Darren Bent and Jermain Defoe make of the whole thing back at home? And Walcott is in the squad for what reason exactly? As I sat in the pub rather impassively with a couple of mates I actually found myself willing the white bloke from Port Vale to score in the 2nd half, which surely would have prompted a multi-million pound bid from Chelsea.